An impressive 80 entries by 28 Wabash Valley artists are featured in the River City Art Association 9th Annual Juried Exhibition in First Financial Bank at Sixth Street and Wabash Avenue. First Financial and vice president of marketing Terry Tevlin hosted the Aug. 4 opening reception and awards ceremony with many of the exhibiting artists attending the First Friday event. Artwork will remain on display for viewing during regular banking hours through Aug. 31. Juror T. Edward Holloman attended the reception to announce winners in four categories as well as Best of Show. Holloman holds an associate’s degree in visual communications from Ivy Tech Community College and a bachelor’s degree in art education from Indiana State University. 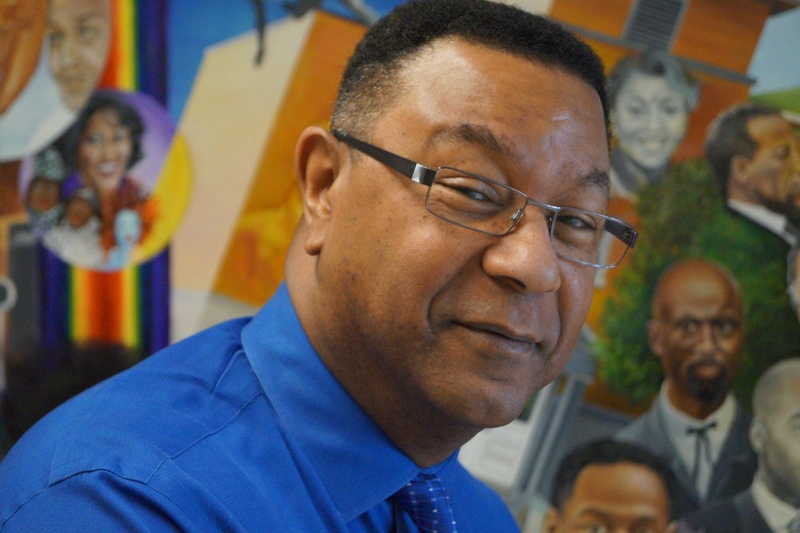 His recent mural, “African American Trailblazers of Terre Haute,” is located inside Terre Haute North Vigo High School where he teaches art. 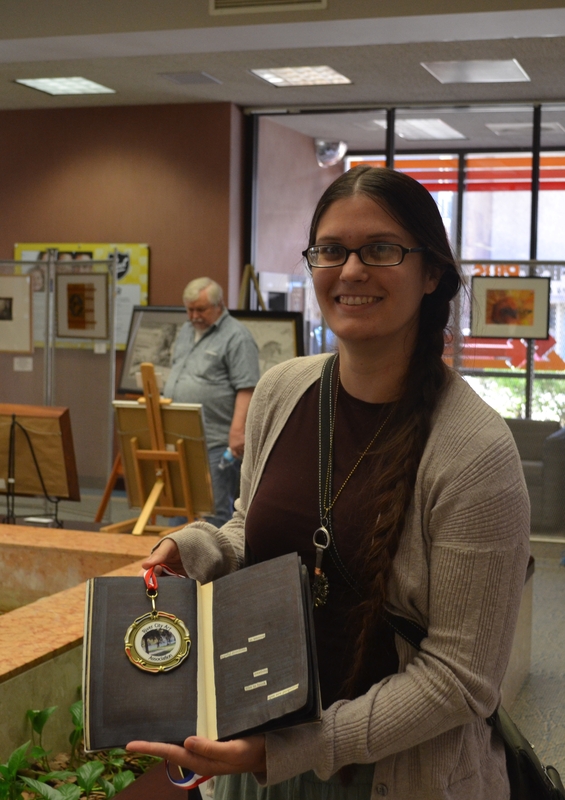 First-place medallions were awarded to Jo Rich-Vadas for her acrylic painting, “Sugar Creek”; Dian Der Ohanian Phillips for her photography entry, “Day Lily 1″; Todd Stokes for his 3-D etched glass mixed media entry, “Strata”; and Jim Rhodes for his work in pencil, “West Texas Winter,” in the drawing category. Second-place honors went to Jo Rich-Vadas for her acrylic painting, “Chicago”; Edith Acton for her fused glass mixed media entry, “Field of Flowers”; Donald Turner for his pastel drawing, “Baptism on the Wabash”; and Spencer Young for his “Badlands Vista” in the photography category. Third-place recognition went to Eloise Lovell for her drawing, “Trotter Tangle”; Steve Harrold for his painting, “Cliff TK-12188”; Jo Rich-Vadas for her mixed media piece, “Here’s Looking At You”; and Alexandra McNichols for her photography entry, “Oglala-Lakota Water Protector,” taken at Standing Rock Sioux Reservation. 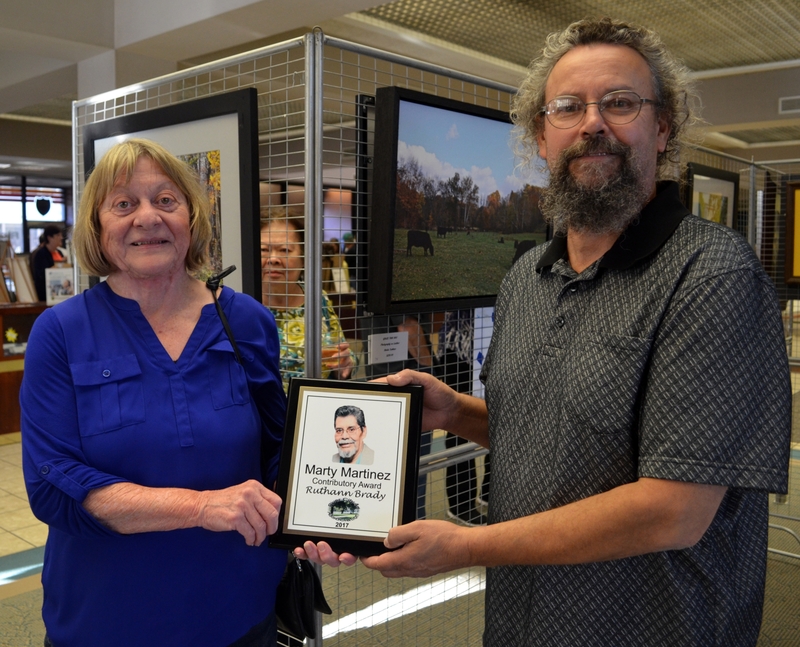 Ruthann Brady received a special award for her dedicated service as a founding member of River City Art Association. RCAA vice president Todd Stokes presented Brady with the Marty Martinez Contributory Award, in memory of the late founding member and owner of the Raven Art Gallery in Terre Haute. The exhibition also features entries by Richard Acton, Willa Barksdale, Debbie Hadley, Stephen Hauser, Deborah Hickman, Christine AB Johnson, founding member Monty “Indiana” Jones, Jennifer Kirk, Mary Mayhew, Gloria Schopper, Judith Lynn Smith, Sheila K. Ter Meer, Jamie Oberste-Vorth and Thomas Wright. RCAA is open to any Indiana and Illinois artist age 18 and older. Artists meet the second Tuesday of each month in the Vigo County Public Library in Terre Haute. For more information visit RiverCityArt.org or contact vice president Todd Stokes at 812-232-0048. This entry was posted in Art Exhibition, Special Event and tagged 9th Annual Juried Exhibition, acrylic, African-American Trailblazers of Terre Haute, altered book, Art, artists, artwork, Badlands, Blackout Poetry:Life, drawings, First Financial Bank, flowers, fused glass, glass etchings, mixed media, mural, Oglala-Lakota Water Protector, paintings, pastel drawing, photography, River City Art Association, Standing Rock Sioux Reservation, Strata, Sugar Creek, T. Edward Holloman, Terre Haute, Wabash Valley. Bookmark the permalink.